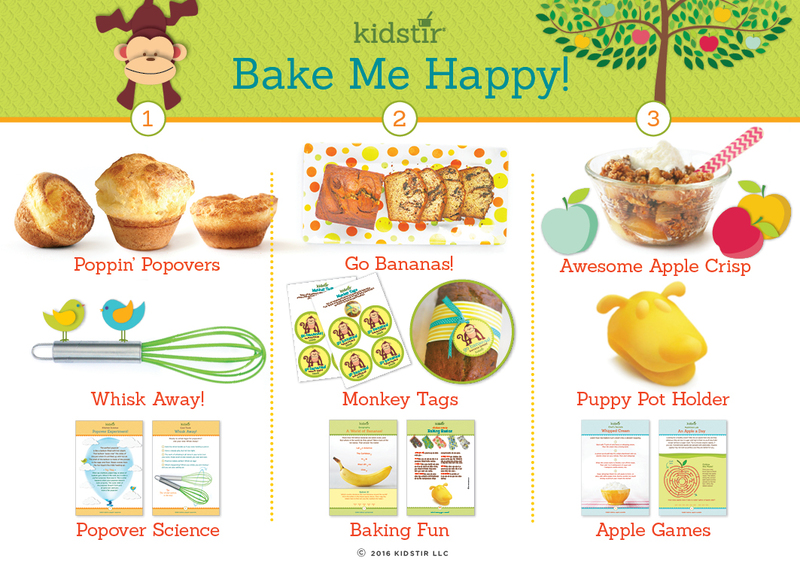 I’m so excited to introduce our September Kids cooking Bake Me Happy Kit! Summer is over, school has started! How did this happen so fast? What to do to create a moment of bliss in the middle of all the hubbub? For me the answer is easy: Bake! Baking is great all year round but especially as the school year starts. Baked goods are perfect for busy mornings, to tuck into school lunches, and serve as playdate snacks. We all love the warm, safe, and happy aroma when something delicious is baking in the oven. It’s the perfect antidote to the excitement (and craziness) as school and extra-curricular activities seem to take over life. Let’s take a peek behind the Kidstir oven door this month. The recipes are so wonderfully varied – suited to breakfast, lunch, and dinner. Some are so easy yet elegant you are going to seriously ask yourself why you’re not making this all the time? Plus, lots of staples + fresh fruits from the grocery store or farmer’s market means you can probably bake something right now, without even stepping out of the house. So pre-heat the oven already! Poppin’ Popovers. I have to straight up tell you that this is one of our most popular recipes for grown-ups and kids alike. 5 ingredients, people! Butter, eggs, milk, flour and salt! So amazingly easy. Kids love seeing their adorable creations pop-up. And so delicious, you’re going to want to serve these as sides to your proteins and soups. Have some left over from the night before? Spread some jam and turn into a yummy breakfast! Go Bananas! I bet you have a great banana bread recipe. So did I. Until our amazing Kidstir team created this one…infused with a surprise swirl of something extra that changes everything. Wrap a loaf for your teacher, neighbor, or sell at your bake sale (for which we’ve got some creative ideas here). Or keep for yourself, and you’ll be set for breakfast and afternoon snacks all week. I love that it keeps our family away from the packaged stuff. Awesome Apple Crisp. One of my favorite things about becoming a mom was discovering so many new activities, like apple picking. Having moved coast to coast, we have loved our apple picking trips in Connecticut and now in Los Angeles. Here are some tips to make your trip to the orchard amazing! And then put your apple haul to use with this yummy recipe. There is a wide variety of skills for kids of all ages, like washing, peeling, slicing, measuring, mixing, and making a crumb topping with healthy oatmeal. Serious fun! 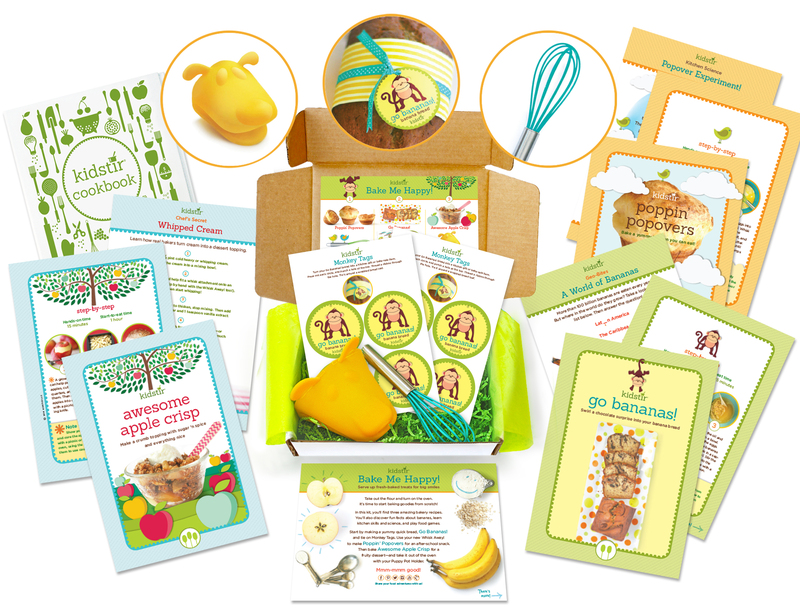 You know a big part of the excitement each month is finding the kid-friendly cooking tools and activities inside each box. Here are the goodies this month! Whisk Away! Okay, this one is a classic, and a special one at that! Our mini-whisk is not only adorable, we love it because it’s so practical. It’s got a stainless steel handle with bright turquoise silicon covered wires. Easy to clean because of the naturally non-stick silicone and the perfect size for little hands and little bowls. It’s become our family’s go to whisk for all sorts of small jobs, whipping up a dinner marinade, a simple omelet, or our easy applesauce muffins. Monkey Tags These are so cute! Little tags perfect to add to gifts for all your favorite people! Just wrap your loaf of banana bread in plastic wrap, foil, or parchment paper, and tie one of these tags on with a simple ribbon. If you run out of the ones we’re sending with the kit, we’ve got more monkey tags for you to download. These are sure-fire winners at the school bake sale (another handy decorative sign here), and a really fun start of the year teacher gift. Puppy Potholder. OMG. Can this get any cuter? Will there be a day that your child doesn’t want to slip their hand into this little puppy potholder and help out in the kitchen? I don’t think so! This potholder is bright yellow and made of silicone, allowing you to handle hot things safely. Whether it’s holding a hot utensil while stirring, grabbing an edge of the pan to pour or lift, sliding something out of the toaster oven to take a peek, this little puppy will win your heart. You are going to love this puppy potholder for cooking! Woof woof! So far we’ve just discussed the recipes and tools in the kit –don’t forget all the great foodie learning tucked into the kit: a Kitchen Science experiment, Technique Tips for perfect whisking, a Geography lesson and game about bananas, Baking Basics kitchen safety rules, Nutrition notes on apples (along with a maze), and a Chef’s Secret lesson on whipping your own fresh cream. Mmmm…And then there are all the additional recipes and activities you can get to complement what’s in the box that you can find on our DIY page. Note to self: Must make Churro Mini Muffins stat. Amazing! Kidstir recently got a rave review from GirlsWorld Bake it Up! magazine for this kit! So go on, bake yourself happy this month with our Bake Me Happy kit! Share your fun times, tips and tricks, and learnings with us on Facebook, Instagram, Pinterest, and Twitter. We love your photos! Happy Baking!